Modern-day Kurt and Courtney/Sid and Nancy were photographed together the most in 2008, and Pete recalls a meeting in 2010, so I’m setting a 2008-2010 timeline of on and off friendship/romance. “She had such a big heart but she was physically small and increasingly frail and I never once saw her eat anything solid, just milkshakes,” he continued. 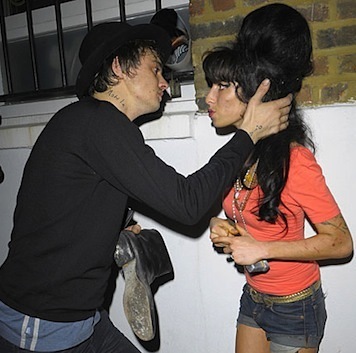 Doherty also talked about Amy’s struggle with the paparazzi (“Amy couldn’t step outside her front door without a mob of about 30 blokes thrusting cameras at her. If you then include crack in the equation, it becomes a real killer”) and revealed that he wrote a song for her called “Flags From The Old Regime” that is unlike his previous work.